The regularly monthly meeting will not be held at the South County regional Library. 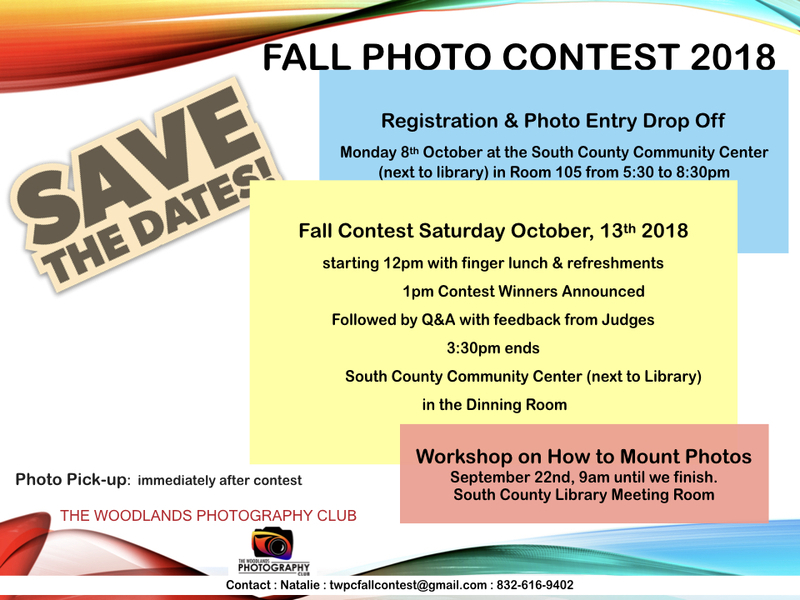 Monday, October 8th, 5:30 - 8:30 PM, the club will be at the South County Community Center (next to the library) for the Fall Contest registration and photo drop off. Registration will be at the South County Community Center (next to the library) in room 105. We hope all members have their photos ready for submission. We are looking forward to an outstanding show of photos at this year's contest. A sign-up genius has gone out to all members asking for food donations for our lunch spread at the contest. If you haven't responded to the sign-up please do so soon. A little something from everyone will go a long way! We hope all members, their families, and friends, are planning to join us at the Fall Contest on October 13, at 12:00 PM. This is a great opportunity to see what our club members have been doing with their cameras this year. We have some very talented artists in our group and you won't want to miss seeing their work! The Library is closed on the second Monday of November in observance of Veteran's Day. Therefore, we will meet outside the library, at 6:30 PM for a photo walk on the waterway. We will have some activities and pointers for shooting at night. Tripods, flashlights, and bottled water are recommended for the outing. More information will be posted as we get closer to the meeting date. If you haven't already done so, it's time to renew your membership! 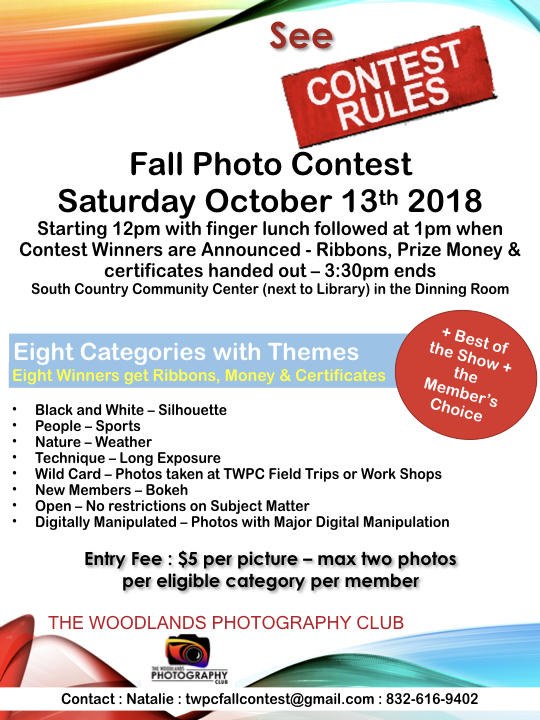 Membership allows access to the Club's Facebook page, participation in the monthly Challenges, Mini-Contests and Slideshows, as well as the Fall Contest. There is still one opening for the 2018 Advisory Board. This co-coordinator will share in the responsibilities of the overseeing and organizing field trips of the club. This will include informing the membership of trip details, collecting fees (for field trips) if necessary, providing driving instructions, and any pertinent information the members may need to know. They will also keep record of field trip , date, time, fees if applicable, and attendance. The field trip coordinator will turn this info over to the secretary for permanent records. The next TWPC Leadership Team meeting is on September 26, 2018 at 6:30 PM at Jason's Deli, 1340 Lake Woodlands Drive, The Woodlands. All members are invited. Need some inspiration? New ideas of what to explore in your photography? The monthly club challenge offers a new opportunity to all Club members; to motivate, practice, get inspired and inspire others with our work! Any member can participate in the monthly Club Challenge posting up to 3 photos according to the monthly subject on Facebook. How long does every challenge last? Every Challenge starts the 2nd day of each month and expires the last day of the month. The Club Challenge Showcase Presentation will be created with all the photos submitted and will be published on Facebook page the 1st day of the following Month. Click the links below to view the Showcase Videos! Every Sunday the photography team creates stunning glamour shots of the shelter animals to make it easier for them to get adopted. Anyone interested in being a photographer, please send an email to mcasvolunteer@gmail.com to receive the guidelines before coming. Assistants are fine to just show up (as long as they have gone through volunteer orientation). 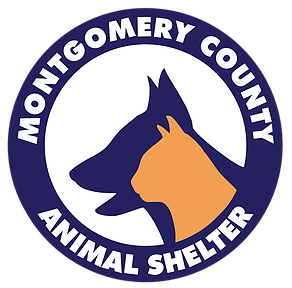 Volunteers are always needed to help take animals to and from their cages, pet them, walk them, or even distract them. Photography skills are not needed to help out, just a love for animals. Click HERE for more information. 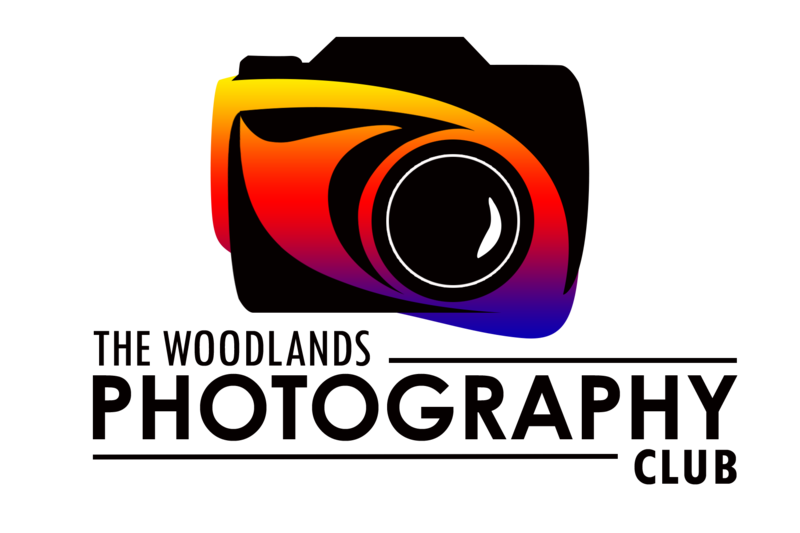 Thank you from The Woodlands Photography Club!